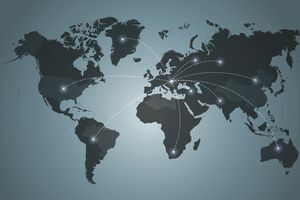 As companies grow larger and the world economy becomes more globalized, the business world expands across borders to help discover, control, and expand new markets internationally. As a result, these organizations need more and more workers to remain competitive in the ever-growing business climate. Companies are hiring employees interested in working alongside others on the global stage, from entry-level positions to management roles in fields such as communications, finance, technology, and government. Are you interested in working overseas? Review these typical qualifications for getting hired for international employment, as well as lists of international business and international affairs job titles. International business is still a newly emerging field, making it very accessible for new graduates entering the workforce or for employees within a company looking to make a change. For most international business jobs, companies require a Bachelor’s degree in a relevant field. Many candidates also have a Master of Business Administration (MBA) or another professional degree such as a Master in International Management (MIIM) to illustrate their passion for business, economics, and management. In addition to education, viable candidates are also successful communicators. These international roles require employees to act as an ambassador or representative for their company and to engage in contracts and deal making with other companies or clients abroad. Companies expect professionals to not only know their products and mission, but also to keep in mind the cultural nuances that may be present. Without the proper respect and consideration for differences in business practices, clients, businesses, and entire markets could be lost. Learning new languages, keeping up with new practices and technologies, and furthering your education are great ways to stay abreast and maintain your competitive edge with international business matters. Here are lists of job titles for international business and international affairs/development positions. Business Development: Companies seeking to expand from national into global organizations require astute business development professionals if they are to control their financial risk and achieve an international presence. Economic Development / International Relief: These job titles are often employed by Non Governmental Organizations (NGOs) such as Action Africa, the American Red Cross, Bank Information Center, Global Justice Now, One Campaign, and Third World Network. Global Trade, Sales and Marketing: According to the World Trade Association (WGO), in 2014 merchandise exports from WTO members totaled US$ 18.0 trillion. Exports of commercial services garnered US$ 4.87 trillion. Global Purchasing and Logistics: Managing international supply chains of products and commodities is a lucrative job – global logistics managers typically make over $95,000 annually. Human Resources: It takes superb strategic planning talents to manage an international workforce. International / Foreign Affairs: Interested in international diplomacy or foreign policy? Here are a few career tracks to consider. International Banking and Finance: Global investment banks are always recruiting top talent – the leading firms are Goldman Sachs, JP Morgan Chase, Barclays, Bank of America Corporation, Morgan Stanley, and Deutsche Bank. International Law: Seeking a career in international law? U.S.News ranks these five international law programs as the best in the country: New York University, Harvard University, Columbia University, Georgetown University, and Yale University. Information Technology (IT) / Technical Operations: Here are a few of the typical IT jobs that require an enthusiasm for living and working abroad. International Travel and Communications: People with a talent for foreign languages have a wide variety of options when it comes to finding work for companies, non-profits, and NGOs operating across the globe. Project Management / Consulting Roles: Here are a few of the opportunities offered for those with management consulting expertise. Ready to apply for a rewarding and exciting career abroad? Check out the best international job search engine sites, as well as these tips for arranging an international job interview.